There’s been a lot of talk lately about how “buy the dip” is no longer working for the US stock market. Not to put too fine a point on it, but…duh. During roaring bull markets you can buy dips, during screaming bear markets you can sell rallies (although bear markets are rarer, briefer, and trickier to navigate than their bull counterparts). It’s not easy to recognize in real-time when the market is switching from one mode to the other, though, which is when most people get hurt. When the market is somewhere in between the two extremes, as it seems to be now, opportunities may emerge on both sides of the market. UNH has also been cited as a stock that is more likely to weather the trade-war storms2—it’s domestic, service-oriented (e.g., no imports or tariffs to worry about), and in a strong (and defensive) sector and industry. 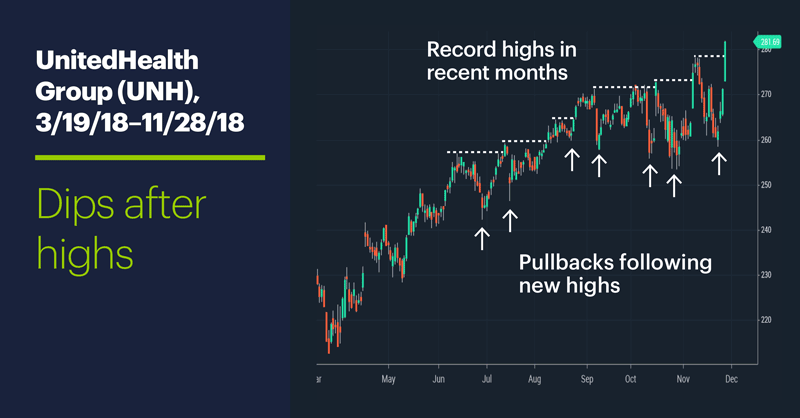 Even if those drivers continue, though, traders will remember that UNH has likely been good to those traders who have bought it on dips in recent months, not ones who chased it as it was making new highs after a nearly 4% up day. The chart shows a fairly consistent pattern in recent months of pullbacks forming soon after most of the new highs. It may be a “trader’s market” these days, but it’s not a market for careless traders. An interesting sector note regarding Powell’s speech: Housing stocks, which had been getting creamed in early trading yesterday on the heels of a lousy New Home Sales number, reversed course after the Fed chairman spoke. 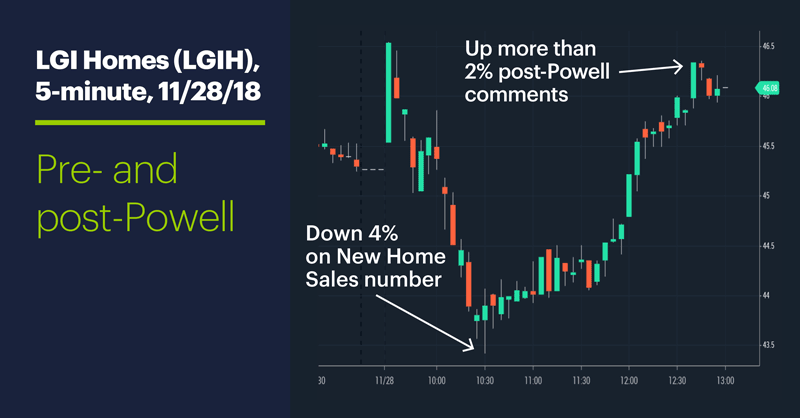 Homebuilder LGI Homes (LGIH, chart below), which was down as much as -4%, jumped to more than 1.5% in the green after Powell’s comments, while D.R. Horton (DHI) flipped from -3% to +1%. A perceived end to rate hikes could translate into homebuilders, lenders, and buyers worrying less about rising mortgage rates. Today’s earnings include: American Woodmark (AMWD), Dollar Tree (DLTR), HP (HPQ), Palo Alto Networks (PANW), VMware (VMW), Workday (WDAY). 2 CNBC.com. Four trade-proof stocks to weather rising China-U.S. tensions. 11/27/18.